Tian Zhuang was dumbfounded. Digging underneath a burial mound near the city of Nanchang, Jiangxi Province, he had uncovered the lid of an immense sarcophagus. Upon lifting the lid, rather than coming face-to-face with an ancient cadaver, he discovered that the two-meter-deep chest was filled with copper coins. "I'd seen bronze coins excavated from other archaeological sites," he recalled to NewsChina. "But, this time, there were mountains of coins! I've never seen so much money in my life!" Further digging in the tomb in late December 2015 uncovered 75 gold coins and hoof-shaped ingots in the tomb. The gold objects – comprising 25 gold hoofs and 50 gold plates – constituted the largest Western Han Dynasty (206 BC to 9 AD) hoard ever discovered. A young, ambitious archeologist in his early 30s, Tian had spent more than four years with his colleagues on the Tomb of the Marquis of Haihun dig site. Tian’s diligence paid off when he became one of the first people in about two millennia to look into this royal burial chamber, one of the best-preserved examples ever found. It was in March 2011 when local farmers in Guanxi village alerted the authorities to the sudden appearance of an odd protuberance on top of what is known locally as "Guoguo," or Guodun Hill. The small hill, overlooking the paddy fields around Boyang Lake, has long been regarded as having auspicious feng shui, and has served as Guanxi village's main cemetery for generations. Local villager Qiu Yilong, 41, told NewsChina that he had heard from some village elders that a former royal was buried beneath the hill, yet nobody knew where the entrance to the tomb might be. When an odd bump appeared atop the hill, Qiu and a few other villagers decided to investigate. They discovered a pit, surrounded by scattered water bottles, some food and tools like hammers, crowbars and gloves. Qiu climbed down into the pit, using the footholds already chiseled into its walls, before stepping onto a wooden platform at the bottom. Qiu immediately realized that looters were responsible for the haphazard excavation. Qiu and his companions recalled that a few years earlier, a neighboring burial mound, later identified as belonging to the wife of the Marquis of Haihun, had been robbed after villagers failed to notify the police about the obvious signs of digging around the site, including an impromptu shelter. When Yang Jun, an archeologist with the Jiangxi Provincial Institute of Cultural Relics and Archaeology, heard about the discovery of the tomb in Guanxi village, the site's location piqued his interest. The so-called Iron River region where the tomb is situated was listed as a provincial-level protected historic zone as early as 1987, when archeologists estimated that around 100 ancient tombs dating from the Han Dynasty were likely located in the area. A cursory survey of the Guanxi site confirmed Yang's suspicion that something special lay beneath the mound. In April 2011, local archeologists began a low-key, systematic survey of the entire site. The necropolis, surrounded by 900-meter-long walls, covered a total area of some 40,000 square meters, equivalent to more than four football fields, and was the site of eight tombs and a chariot burial site. Before the team even began to dig, they knew they were dealing with a site of extraordinary historical importance. From 2012 to 2013, preliminary excavations began in peripheral areas of the site, including the chariot burial site, three affiliated tombs, two monumental gateways and the necropolis' internal drainage and road system. Other than a jade sword, fragmentary lacquerware and some broken earthenware, the three tombs were found to have been emptied by looters. Nevertheless, on November 4, 2015, the Jiangxi provincial government announced the discovery of one of China's most complete royal necropolises. Viewed from above, the main mausoleum consists of a rectangular inner chamber surrounded by separate structures – described as "treasure houses" – along its four sides. Gold and jade items were even crammed into the space between the outer and inner sarcophagi, where archeologists also discovered a piece of lacquerware decorated with gold leaf. Altogether, more than 10,000 objects were unearthed, amounting to about 10 tons of copper coins, ceremonial chimes, bamboo strips covered in writing, tomb figurines and other rare objects. Royal burial customs of the Han Dynasty were extravagant, making suspected Han tombs a magnet for grave robbers, but, if found intact, an archeologist's dream. The fact that looters had managed to miss the main chamber of the Marquis of Haihun was pure luck – the shaft discovered by local villagers passed within inches of the outer edge of the Marquis' sarcophagus. As the main chamber was submerged beneath the water table, it was protected from oxidization, an inundation that possibly occurred during an earthquake recorded in 318 AD that flooded areas around Boyang Lake. Zhang Zhongli, a senior archeologist from the Shaanxi Archeology Research Institute, described finding surviving wooden structures – believed to be monumental gateways – in the 2,000-year-old tomb as a particular thrill. 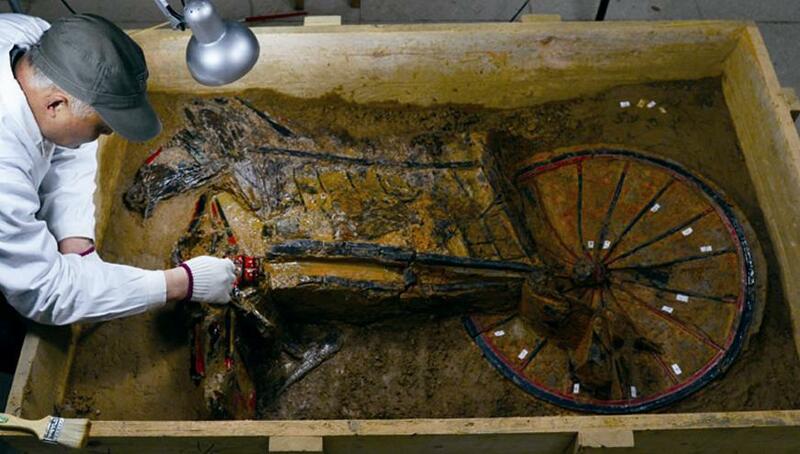 Despite the waterlogged, acidic soil and humid climate around Nanchang, organic material, including five wooden chariots still flecked with colored paintwork accompanied by the remains of 20 horses, were discovered – the first such find in a southern Chinese tomb of such an early date. However, the water that had preserved some artifacts had devastated others, washing ink off handwritten bamboo slips and causing waterlogged lacquerware items to disintegrate upon contact with the air. Archeologist Guan Li described tagging the interiors of once-splendid lacquerware chests and bamboo baskets to mark where long-rotted silk garments were once folded and stored. "The tomb's occupant was probably someone very careful about his dress and appearance," Guan told NewsChina. As work progressed, quadrant by quadrant, a complete picture of the layout of the tomb emerged. Along with the hoard of bronze coins, a large number of gold plates, elegant jade articles and more than 3,000 accessories embellished in gold and silver were excavated. According to bronze conservation expert Yang Xiaolin of the National Museum of China, the gold excavated at the Guanxi tomb was of considerable purity, with most individual pieces weighing around 250 grams. "People were joking that we’d dug up a bank," Yang Jun told our reporter. Archeologists at the site have surmised that the tomb belongs to Liu He, grandson of the Wu Emperor of the Western Han Dynasty. The extravagance of the tomb, they believe, is in accordance with Liu He's special status at the imperial court – he received the title Marquis of Haihun after his extremely brief, 27-day reign as emperor was nullified, placing him in a unique sociopolitical position that might explain his lavish funerary accommodations. Historical texts agree that the Marquis of Haihun died in Changyi, some 30 kilometers northwest of Jianchang and close to where the newly excavated tomb is situated. Some accounts suggest the existence of one big tomb and 200 minor satellite tombs surrounding it. Historical texts, which tended to view short-lived emperors with disdain, describe Liu as tall but "ugly and unhealthy-looking" with "a dark complexion, small eyes and no facial hair." Liu reportedly suffered from rheumatism and "struggled when moving around." These two factors might explain why two couches were unearthed in two separate parts of the tomb, according to Xin Lixiang, head of the excavation team. While the identity of the man buried in the main chamber remains unconfirmed, careful analysis of the artifacts discovered indicated that a royal personage is indeed interred at Guanxi. In the northeastern corner of the tomb, 10 ancient bronze cauldrons were found, perturbing Chinese archeologists accustomed to finding a maximum of nine such artifacts in the tombs of emperors, with smaller numbers for those lower down on the pecking order. Finding 10 at Guanxi, some have concluded, indicates the burial of a person of considerable rank. Xin Lixiang, who is also a specialist on the Qin and Han dynasties with the National Museum of China, posited that the 10 cauldrons might be two sets of "seven and three" or "five and five." More surprises were to come. On November 14, archeologists working at the site unearthed and restored a bronze engraving of Confucius on a broken lacquer screen found in the western part of the tomb's main chamber. Xin Lixiang explained that this portrait is the earliest surviving portrait of the Great Sage. "This shows the contemporary cultural environment of the nobility," Zhang Zhongli told our reporter. "The lacquer screen Confucius portrait is likely a piece of furniture used by the Marquis of Haihun in his lifetime, since lacquer screens were not usually used as grave goods." A bronze still unearthed at the site has also proven that the Chinese were distilling liquor at least a thousand years earlier than previously believed – the second oldest surviving still in China dates from the Yuan Dynasty (1271-1368), as do the earliest written descriptions of Chinese distilled spirits. "This discovery has altered our understanding of distillation in China," Zhang told China Daily, adding that distilled liquor was likely a luxury enjoyed only by aristocrats during the Western Han Dynasty. A number of intact musical instruments were also discovered, including bronze chimes, a se (a 25-string plucked instrument), pan flutes and sheng (reed pipe wind instruments), as well as terracotta figurines demonstrating how the instruments were played. On January 15, the inner sarcophagus was carefully encased in a wooden crate and transported to a nearby laboratory for further examination. The coffin will be analyzed in a hermetically sealed environment, with researchers searching for specific items such as seals or engraved jade raiments that might help identify its occupant. According to Li Cunxin from the Institute of Archaeology, Chinese Academy of Social Sciences, initial scans of the sarcophagus detected gold, jade items and textiles within. Li added that the earliest possible confirmation that the mummy is that of Liu He would not come for a few months. The research team's final report will probably not be published for a decade. According to Yang Jun, "two generations" will be needed to fully realize the importance of the Guanxi tomb. Qiu Yilong, the villager who discovered the tomb, has found new employment as an adviser to the archeological team. Villagers from neighboring areas often come to the site, approaching the police guarding the dig to claim kinship with the Marquis of Haihun and, potentially, a share of the wealth found in the grave of their "ancestor." "Many people want to find a way to profit [from the site]," Yang Jun told NewsChina. "[This is] either through seeking compensation or purely finding an excuse to get a look inside the tomb." Chen Wei and Long Longfei contributed to this report.